As many know, the book of Revelation has many different interpretations from people from all different backgrounds. Interestingly enough, no matter what interpretation you believe in or feel confident in, everyone comes to the same general conclusion about the book: God wins. As cool as it is that the conclusion seems to be the same, the details of the interpretation getting there are far from the same. Another book that has some similarities in the content of Revelation is Daniel, and some of the details of Daniel’s prophecy sound oddly similar to the details of John’s revelation. One form of interpretation of Revelation is a historic interpretation in which the revelation is said to be about the empires from Babylon to Rome and its emperors. Along with this historic view of the revelation, comes the details of persecution and freedom from persecution—hence the conclusion that God wins. One of the big reasons behind this belief comes from Revelation 1:1-3 in which John writes, “The revelation of Jesus Christ, which God gave him to show to his servants the things that must soon take place. He made it known by sending his angel to his servant John, (2) who bore witness to the word of God and to the testimony of Jesus Christ, even to all that he saw. (3) Blessed is the one who reads aloud the words of this prophecy, and blessed are those who hear, and who keep what is written in it, for the time is near.” Also from Revelation 22:6 and 10, “ And he said to me, “These words are trustworthy and true. And the Lord, the God of the spirits of the prophets, has sent his angel to show his servants what must soon take place.” Rev 22:10 “And he said to me, “Do not seal up the words of the prophecy of this book, for the time is near.” The historic view of Revelation comes from “soon take place” and “the time is near”, and the idea is that because of those phrases the prophecies from Revelation must be about something that happened in that generation’s time of living. So the historic interpretation looks at how some of the details of Revelation must pertain to the time leading up to and the time very soon after the occurrence of John’s Revelation. One of the prophecies from Daniel that lines up with a detail of Revelation has a very interesting historic interpretation. The correlation comes from chapter 7 of Daniel with the four beasts, and chapter 13 of Revelation with the beast coming out of the sea. Dan 7:1-28 In the first year of Belshazzar king of Babylon, Daniel saw a dream and visions of his head as he lay in his bed. Then he wrote down the dream and told the sum of the matter. (2) Daniel declared, “I saw in my vision by night, and behold, the four winds of heaven were stirring up the great sea. (3) And four great beasts came up out of the sea, different from one another. (4) The first was like a lion and had eagles’ wings. Then as I looked its wings were plucked off, and it was lifted up from the ground and made to stand on two feet like a man, and the mind of a man was given to it. (5) And behold, another beast, a second one, like a bear. It was raised up on one side. It had three ribs in its mouth between its teeth; and it was told, ‘Arise, devour much flesh.’ (6) After this I looked, and behold, another, like a leopard, with four wings of a bird on its back. And the beast had four heads, and dominion was given to it. (7) After this I saw in the night visions, and behold, a fourth beast, terrifying and dreadful and exceedingly strong. It had great iron teeth; it devoured and broke in pieces and stamped what was left with its feet. It was different from all the beasts that were before it, and it had ten horns. (8) I considered the horns, and behold, there came up among them another horn, a little one, before which three of the first horns were plucked up by the roots. And behold, in this horn were eyes like the eyes of a man, and a mouth speaking great things. (9) “As I looked, thrones were placed, and the Ancient of Days took his seat; his clothing was white as snow, and the hair of his head like pure wool; his throne was fiery flames; its wheels were burning fire. (10) A stream of fire issued and came out from before him; a thousand thousands served him, and ten thousand times ten thousand stood before him; the court sat in judgment, and the books were opened. (11) “I looked then because of the sound of the great words that the horn was speaking. And as I looked, the beast was killed, and its body destroyed and given over to be burned with fire. (12) As for the rest of the beasts, their dominion was taken away, but their lives were prolonged for a season and a time. (13) “I saw in the night visions, and behold, with the clouds of heaven there came one like a son of man, and he came to the Ancient of Days and was presented before him. (14) And to him was given dominion and glory and a kingdom, that all peoples, nations, and languages should serve him; his dominion is an everlasting dominion, which shall not pass away, and his kingdom one that shall not be destroyed. (15) “As for me, Daniel, my spirit within me was anxious, and the visions of my head alarmed me. (16) I approached one of those who stood there and asked him the truth concerning all this. So he told me and made known to me the interpretation of the things. (17) ‘These four great beasts are four kings who shall arise out of the earth. (18) But the saints of the Most High shall receive the kingdom and possess the kingdom forever, forever and ever.’ (19) “Then I desired to know the truth about the fourth beast, which was different from all the rest, exceedingly terrifying, with its teeth of iron and claws of bronze, and which devoured and broke in pieces and stamped what was left with its feet, (20) and about the ten horns that were on its head, and the other horn that came up and before which three of them fell, the horn that had eyes and a mouth that spoke great things, and that seemed greater than its companions. (21) As I looked, this horn made war with the saints and prevailed over them, (22) until the Ancient of Days came, and judgment was given for the saints of the Most High, and the time came when the saints possessed the kingdom. (23) “Thus he said: ‘As for the fourth beast, there shall be a fourth kingdom on earth, which shall be different from all the kingdoms, and it shall devour the whole earth, and trample it down, and break it to pieces. (24) As for the ten horns, out of this kingdom ten kings shall arise, and another shall arise after them; he shall be different from the former ones, and shall put down three kings. (25) He shall speak words against the Most High, and shall wear out the saints of the Most High, and shall think to change the times and the law; and they shall be given into his hand for a time, times, and half a time. (26) But the court shall sit in judgment, and his dominion shall be taken away, to be consumed and destroyed to the end. (27) And the kingdom and the dominion and the greatness of the kingdoms under the whole heaven shall be given to the people of the saints of the Most High; his kingdom shall be an everlasting kingdom, and all dominions shall serve and obey him.’ (28) “Here is the end of the matter. As for me, Daniel, my thoughts greatly alarmed me, and my color changed, but I kept the matter in my heart.” Rev 13:1-10 And I saw a beast rising out of the sea, with ten horns and seven heads, with ten diadems on its horns and blasphemous names on its heads. (2) And the beast that I saw was like a leopard; its feet were like a bear’s, and its mouth was like a lion’s mouth. And to it the dragon gave his power and his throne and great authority. (3) One of its heads seemed to have a mortal wound, but its mortal wound was healed, and the whole earth marveled as they followed the beast. (4) And they worshiped the dragon, for he had given his authority to the beast, and they worshiped the beast, saying, “Who is like the beast, and who can fight against it?” (5) And the beast was given a mouth uttering haughty and blasphemous words, and it was allowed to exercise authority for forty-two months. (6) It opened its mouth to utter blasphemies against God, blaspheming his name and his dwelling, that is, those who dwell in heaven. (7) Also it was allowed to make war on the saints and to conquer them. And authority was given it over every tribe and people and language and nation, (8) and all who dwell on earth will worship it, everyone whose name has not been written before the foundation of the world in the book of life of the Lamb who was slain. (9) If anyone has an ear, let him hear: (10) If anyone is to be taken captive, to captivity he goes; if anyone is to be slain with the sword, with the sword must he be slain. Here is a call for the endurance and faith of the saints. The sea beast in Revelation has six similar characteristics with the beasts in Daniel: came up from the sea (Dan. 7:3; Rev. 13:1), a lion (Dan. 7:4; Rev. 13:2), a bear (Dan. 7:5; Rev. 13:2), a leopard (Dan. 7:6; Rev. 13:2), ten horns (Dan. 7:7; Rev. 13:1), and a mouth speaking great things (Dan. 7:8; Rev. 13:5). Looking at the sea beast in Revelation and the four beasts in Daniel, one way of interpreting this is that the four beasts describe the four kingdoms from Babylon to Rome, with Rome being the final beast in Daniel. 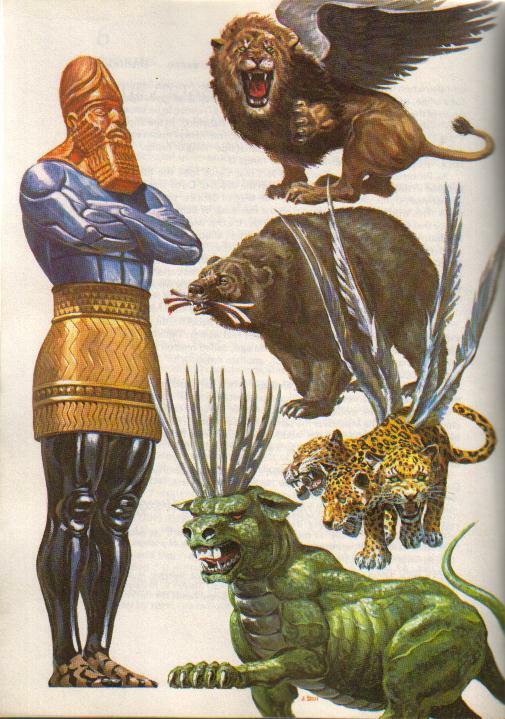 One thing to note here is that in Daniel it is four different beasts while in Revelation it is all one beast with the characteristics of the four separate beasts. This may make some skeptical, but it seems to fit together rather well regardless of this fact. The idea of the four beasts being the four kingdoms goes back to another prophecy in Daniel chapter 2 in which the fall of Babylon, the rise of the next three kingdoms, and the coming of the kingdom of God is prophesied. The kingdoms go in chronological order so the first is Babylon, the second is Medo-Persia, the third is Greece, and the fourth is Rome. The first beast in Daniel is the one that is like a lion which is said to represent the Babylonian empire and King Nebuchadnezzar. The description given in Daniel 7:4 is said to represent King Nebuchadnezzar’s fall from authority. For those that don’t know the story, King Nebuchadnezzar was foretold of his end as a ruler through a prophecy involving a tree. However, it is rather interesting to see how that this depiction of a lion with eagle’s wings fits the same visual we get of King Nebuchadnezzar’s humbling. The King was very proud at heart and God warned him through propchecy in Daniel 4 that he would fall when he became proud. In Daniel 7:4 we have a lion—known to be a great and powerful animal—with eagle’s wings—which can depict being above all else. However, these wings were plucked, and the beast was set on the ground and given a man’s heart. Just as was said, all of this fits into the description of how the King was greatly lowered in honor, and was ended with an average man’s honor rather than a king’s. The second beast is the one like a bear in Daniel 7:5. The bear is said to represent the Medo-Persian Empire and is said to raised up on one side with three ribs in its mouth. The bear represents the Medo-Persians because that empire historically was known to be strong but slow moving like a bear. The empire is described to be raised up on one side because it was split between the Medes and the Persians, but the Persian side was dominant and had more power. Moreover, the three ribs in its mouth also describe the kingdom’s devouring nature, and some speculate that the three ribs represent Assyria, Egypt, and Syria which were captured by the Medo-Persian empire. The third beast is the one like a leopard in Daniel 7:6 which is supposed to represent Greece. The leopard had on the back of it four wings of a bird and four heads. A leopard with four wings represents Greece because of the speed in which Alexander the Great conquered the span of land that it did. The four heads is supposed to represent the four division of Greece after Alexander and the four generals that took over: Lysimachus, Cassander, Seleucus, and Ptolemy. The fourth beast is the one that receives the most description and it is said to represent Rome. Some of its description found in Danel 7:7-15 is that it had great iron teeth,it had ten horns, a little horn that came up where there were three, and there is a description of some form of destruction of the empire. The iron teeth are supposed to represent the strength of the empire, the ten horns are supposed to represent ten kings, and the little horn represents an eleventh ruler that comes after three are uprooted. This is where the interpretation and the similarity become a little dicey. The then horns are supposed to represent Augustus, Tiberiaus, Gaius, Claudius, Nero, Galba, Otho, Bitellius, Vespasian, and Titus. Galba, Otho, and Bitellius are supposed to represent the three horns replaced by the little horn, and the explanation given is that these three didn’t have power very long. The little horn that takes the place is Domitian. I say that this is a little dicey not just because of the three being replaced being a rough interpretation, but the beast in Revelation 17:7-121 is also supposed to be represented by the ten horns in Daniel 7 even though that beast may be a different beast than the sea beast. Rev 17:7-12 But the angel said to me, “Why do you marvel? I will tell you the mystery of the woman, and of the beast with seven heads and ten horns that carries her. (8) The beast that you saw was, and is not, and is about to rise from the bottomless pit and go to destruction. And the dwellers on earth whose names have not been written in the book of life from the foundation of the world will marvel to see the beast, because it was and is not and is to come. (9) This calls for a mind with wisdom: the seven heads are seven mountains on which the woman is seated; (10) they are also seven kings, five of whom have fallen, one is, the other has not yet come, and when he does come he must remain only a little while. (11) As for the beast that was and is not, it is an eighth but it belongs to the seven, and it goes to destruction. (12) And the ten horns that you saw are ten kings who have not yet received royal power, but they are to receive authority as kings for one hour, together with the beast. Not only that, but this interpretation calls for each head (there are seven) to be one of the ten that aren’t uprooted, but the little horn in Daniel is supposed to be represented by the eighth head in Rev. 17:11. What about the other three?? I suppose those three are covered in the ten horns of in verse 12? Like I said, this interpretation gets a little dicey here. However, regardless of this detail, the rest of the details are seemingly free of the same problem. Regardless of the small hang up with the specific kings to talk about, the match between the sea beast in Revelation 13 and the four beasts in Daniel 7 is quite exquisite. To (maybe) bring some clarity to the match-up think of the sea beast as a representation of kingdoms that rule over God’s people in this pivotal moment of Jewish and Christian history. There are four kingdoms and each ruled with different strengths, conquered at different speeds, and ruled in different manners. The only major difference in description between the two is that in Daniel there were four beasts and in Revelation there was one beast with four different parts. This however, is not a huge discrepancy since the one beast in Revelation can be seen to represent kingdoms as a whole. One thing that I brought up in the beginning was how these stories depict the moral that God wins. This idea really fits in Revelation because throughout you see the elements symbolizing God or the church eventually becoming victorious in some manner. Likewise, this idea fits Daniel in several ways. Just as the church was being persecuted when Revelation was written, the Israelites were beginning their persecution under the Babylonian empire during the time of Daniel. Moreover, a recurring theme in Daniel’s visions is that God will be victorious, and this is especially clear in Daniel’s interpretation of Nebuchadnezzar’s dream about the four kingdoms in Daniel 2. When the symbol for the Roman Empire comes around in that prophecy, it ends with a rock symbolizing the kingdom of God destroying it. This is where many delusions about a war-hero Messiah likely came from, but what Daniel received was the same thing that John received: a depiction of God as the winner. It is certainly evident that there are a lot of similarities between Daniel and Revelation. There are similar prophetic details, there are similar overarching ideas, a similar message, and a similar confusion bound to them concerning their interpretation. Could it mean this historical stuff? Sure, it definitely has some credibility. However, at the end of the day all we can really conclude with surety is that the message was supposed to give the audience the hope of a brighter future. Therefore, all I can concretely give as my interpretation is this one thing: God will win. **Facts and symbolism comes from material made by Pat Mannon, a source I trust and respect. Posted on April 6, 2015 by dgaskins08	This entry was posted in Uncategorized. Bookmark the permalink.